Nearly a year before Attorney General Jeff Sessions fired senior FBI official Andrew McCabe for what Sessions called a "lack of candor," McCabe oversaw a federal criminal investigation into whether Sessions lacked candor when testifying before Congress about contacts with Russian operatives, sources familiar with the matter told ABC News. Add Trump Administration as an interest to stay up to date on the latest Trump Administration news, video, and analysis from ABC News. Democratic lawmakers have repeatedly accused Sessions of misleading them in congressional testimony and called on federal authorities to investigate, but McCabe's previously-unreported decision to actually put the attorney general in the crosshairs of an FBI probe was an exceptional move. One source told ABC News that Sessions was not aware of the investigation when he decided to fire McCabe last Friday less than 48 hours before McCabe, a former FBI deputy director, was due to retire from government and obtain a full pension, but an attorney representing Sessions declined to confirm that. Last year, several top Republican and Democratic lawmakers were informed of the probe during a closed-door briefing with Deputy Attorney General Rod Rosenstein and McCabe, ABC News was told. By then, Sessions had recused himself from the FBI’s probe of Russia’s meddling in the 2016 presidential election, giving Rosenstein oversight of the growing effort. US Attorney General Jeff Sessions testifies before a House Judiciary Committee hearing on November 14, 2017, in Washington, DC. Within weeks, Rosenstein appointed special counsel Robert Mueller to take over the investigation and related inquiries, including the Sessions matter. Two months ago, Sessions was interviewed by Mueller's team, and the federal inquiry related to his candor during his confirmation process has since been shuttered, according to a lawyer representing Sessions. "The Special Counsel's office has informed me that after interviewing the attorney general and conducting additional investigation, the attorney general is not under investigation for false statements or perjury in his confirmation hearing testimony and related written submissions to Congress," attorney Chuck Cooper told ABC News on Wednesday. According to the sources, McCabe authorized the criminal inquiry after a top Democrat on the Senate Judiciary Committee, Sen. Patrick Leahy, D-Vermont, and then-Sen. Al Franken, D-Minn., wrote a letter in March 2017 to the FBI urging agents to investigate "all contacts" Sessions may have had with Russians, and "whether any laws were broken in the course of those contacts or in any subsequent discussion of whether they occurred." It's unclear how actively federal authorities pursued the matter in the months before Sessions' interview with Mueller’s investigators. It's also unclear whether the special counsel may still be pursuing other matters related to Sessions and statements he has made to Congress – or others – since his confirmation. During his confirmation in January 2017, Sessions told the Senate committee that he had not been in contact with anyone connected to the Russian government about the 2016 election. He also said he was "not aware" of anyone else affiliated with the Trump campaign communicating with the Russian government ahead of the election. Two months later, after a Washington Post report disputed what Sessions told Congress, the attorney general acknowledged he had met the Russian ambassador twice during the presidential campaign, but insisted none of those interactions were "to discuss issues of the campaign." Sessions "made no attempt to correct his misleading testimony until The Washington Post revealed that, in fact, he had at least two meetings with the Russian ambassador," Leahy and Franken said in a statement at the time. "We know he would not tolerate dishonesty if he were in our shoes." Sessions called any suggestions that he misled lawmakers "false." 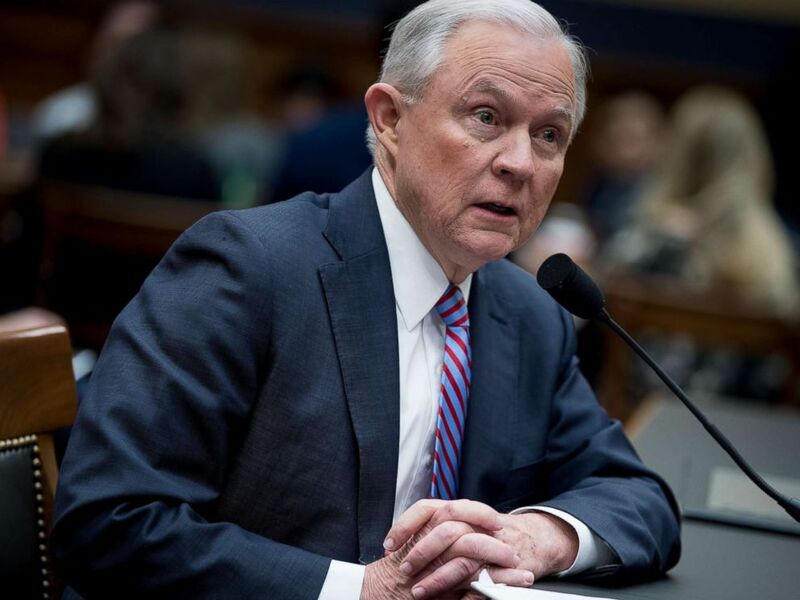 Nevertheless, charges subsequently brought by Mueller raised more questions over Sessions' testimony to Congress. In November, former Trump campaign adviser George Papadopoulos admitted to federal authorities that during the campaign he was in frequent contact with Russian operatives about setting up a meeting between Trump and Russian President Vladimir Putin, and Papadopoulos pitched the idea to Sessions and Trump at a meeting of the then-candidate's foreign policy team in March 2016. Acting FBI Director Andrew McCabe, testified in front of the Senate Intelligence Committee, on Capitol Hill, June 7, 2017. Sessions later told lawmakers he "always told the truth," insisting he didn’t recall the March 2016 meeting when first testifying to Congress. He later remembered the meeting after reading news reports about it, he said. "We are concerned by Attorney General Sessions' lack of candor to the Committee and his failure thus far to accept responsibility for testimony that could be construed as perjury," Leahy and Franken said in their March 2017 letter to then-FBI director James Comey, who was fired by Trump two months later. It is a federal crime for anyone to knowingly provide false information to Congress – or to a federal law enforcement agency. No charges have been announced against McCabe, and there’s no indication that the FBI has recommended he be charged. McCabe was fired Friday after the Justice Department's inspector general concluded that McCabe misled investigators looking into how Justice Department and FBI officials handled matters associated with the 2016 presidential election. In October 2016, hoping to push back on a series of news reports questioning whether he might be trying to protect Hillary Clinton, McCabe authorized two FBI officials to speak with a reporter about his efforts to boost the FBI's investigation of the Clinton Foundation. When he was questioned later about that decision, McCabe "lacked candor – including under oath – on multiple occasions," Sessions said in a statement announcing McCabe's firing. "The FBI expects every employee to adhere to the highest standards of honesty, integrity, and accountability," Sessions said. "As the [FBI's ethics office] stated, 'all FBI employees know that lacking candor under oath results in dismissal and that our integrity is our brand.'" McCabe vehemently denies misleading investigators, saying in his own statement that he is "being singled out and treated this way because of the role I played, the actions I took, and the events I witnessed in the aftermath of the firing of James Comey." For more than a year, Trump and other Republicans have questioned whether McCabe harbored a political bias when making law enforcement decisions as deputy director. 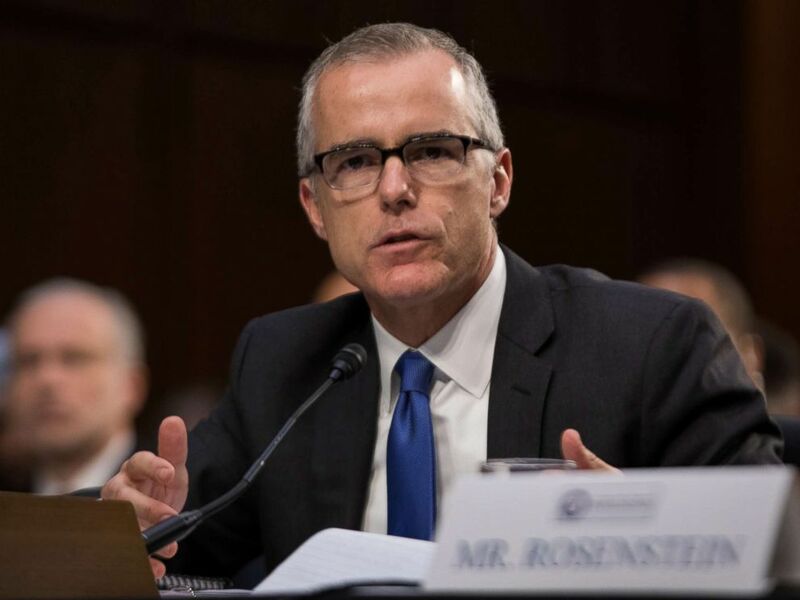 McCabe's critics point to his ties to Democrats, particularly his wife's failed Democratic run for state senate in Virginia nearly three years ago. But in an interview with ABC News, McCabe insisted politics was "absolutely not" a factor in any of the decisions he made, noting he has considered himself a Republican all his life. A representative for McCabe declined to comment for this article. Franken, one of the two senators who pushed the FBI to investigate Sessions, resigned from Congress in December amid several claims of sexual misconduct.